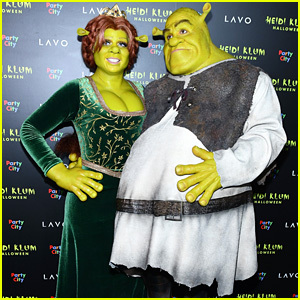 Heidi Klum & Boyfriend Tom Kaulitz Are Shrek & Princess Fiona at Annual Halloween Party! Heidi Klum and Tom Kaulitz are a perfect pair as Shrek and Princess Fiona! The 45-year-old America’s Got Talent judge and the 29-year-old Tokio Hotel musician posed for pictures on the red carpet at Heidi Klum’s 19th Annual Halloween Party at Lavo on Wednesday night (October 31) in New York City. Tom‘s brother Bill, dressed up in drag, also hit the red carpet with the couple. They also posed with Mike Myers – otherwise known as the voice of Shrek himself! Heidi documented the incredible transformation into their costumes on her Instagram later that night. Watch her apply the finishing touches below! And if you haven’t already, check out all of Heidi‘s amazing costumes through the years.